This battle, in the North Sea, was the only naval battle of the war in which the main German and British fleets engaged each other. Previously and subsequently, the naval war was a series skirmishes with German raiders and submarines. The British were successful in blockading the Germans, while the Germans were successful in blocking aid to the Russians and sinking a large number of British merchant vessels with submarines. 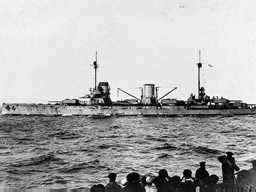 The battle itself was a tactical victory for the Germans, who sunk twice as much tonnage as the British. The results did not change the strategic situation, however, and the Germans resorted to unrestricted submarine warfare that ultimately resulted in the US intervention.